Another early bus ride into the city, another second breakfast at first light in Hart’s Bakery (context is here) – and as I lurched out of that warm, friendly and bustling establishment, the tints of sunrise were above and, looking up, I saw this. 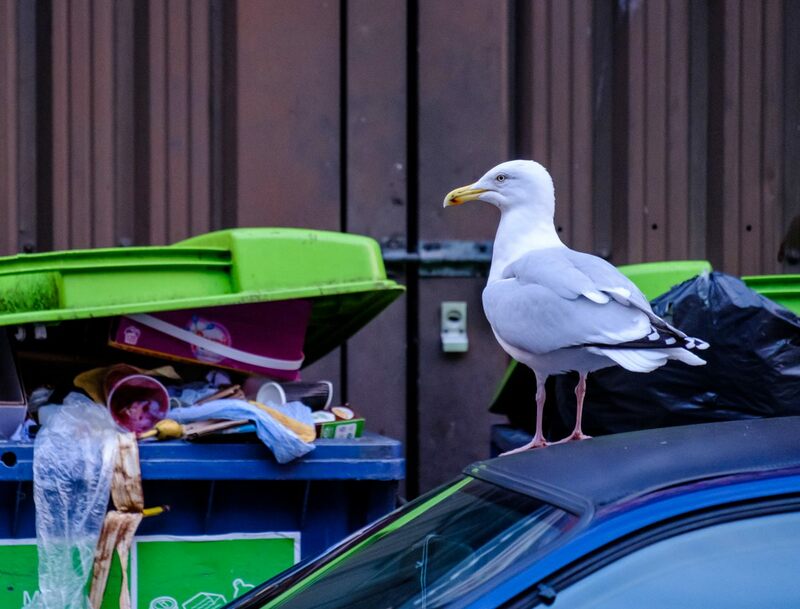 The bird is a gull (aka seagull), and just about to leap off into the air to scavenge the city’s no doubt enticing refuse. I have Hart’s Bakery, (s)he has Bristol. Technique: X-T1 with 55-200 Fujinon lens at 305mm (equiv); 3200 ISO; beside Temple Meads railway station; 9 Dec 2016. 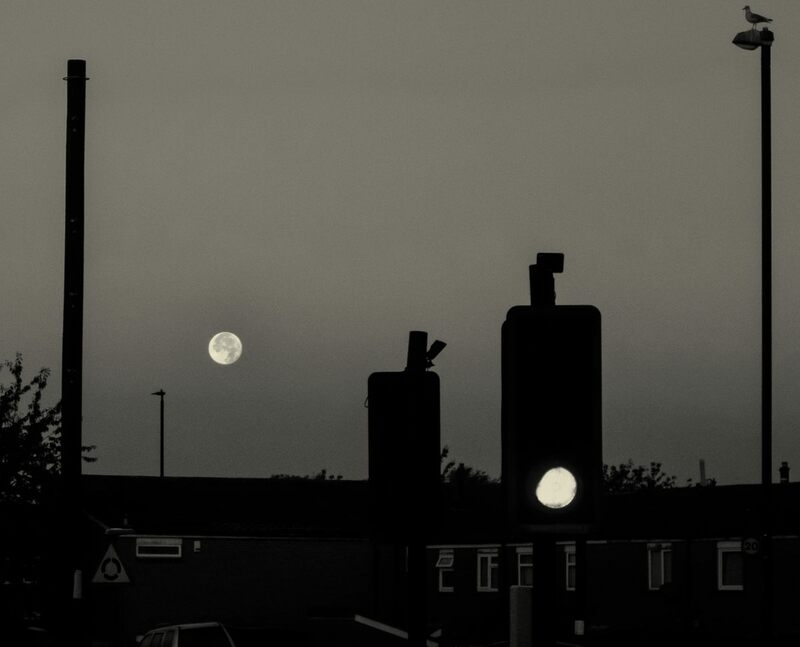 Just after dawn, the Moon sets over the outer suburbs. 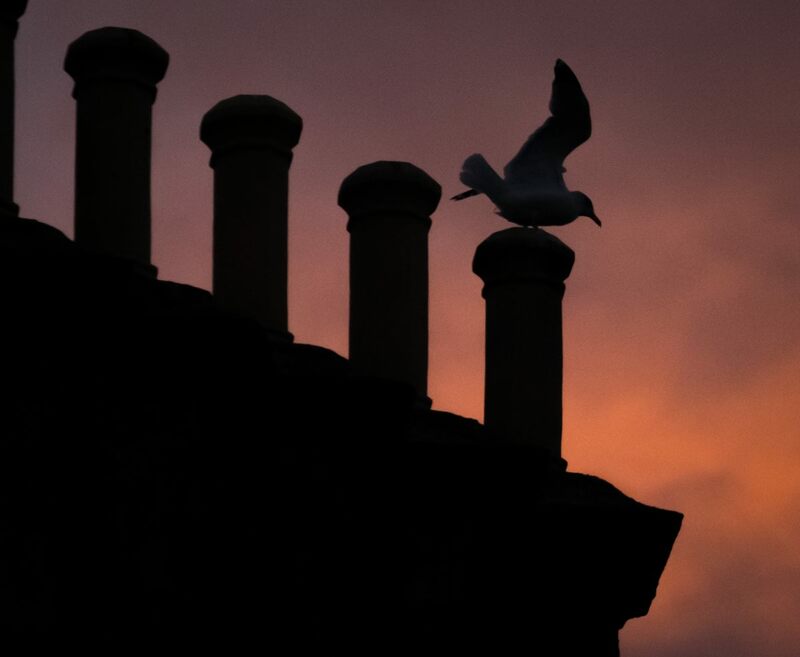 A green light beckons me on, and a gull, high up on a vantage point in the early light, looks for its first feed of the day. The first image in the Outer Suburbs series, with context, is here: 1 . Subsequent images are here: 2 3 4 5 6 7 8 9 10 11 12 13 14 15 16 17 18 19 20 21 22 23 24 25 26 27 . Each will open in a separate window. Technique: TG-5 at 100mm (equiv); 800 ISO; Lightroom, using the Camera Natural film simulation; Silver Efex Pro 2, starting at the Full Spectrum Inverse preset with a light Coffee tone; south Bristol; 25 Oct 2018. This image is best viewed enlarged: click onto it to open a larger version in a separate window, and click onto that image to enlarge it yet again. 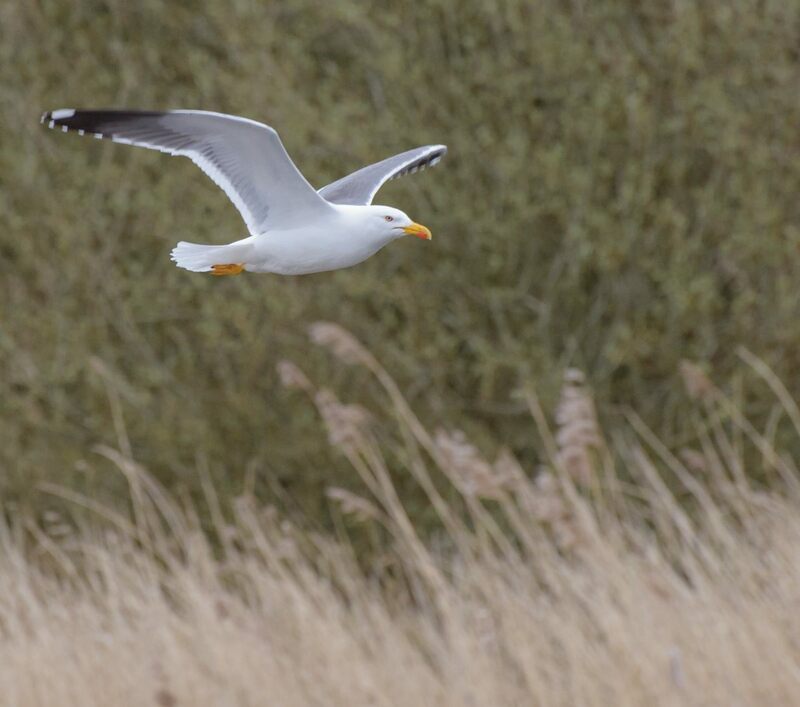 Adult Lesser Black-backed Gull at Herriots Bridge, Chew Valley Lake, Somerset; 17 Apr 2018. Technique: D800 with 70-300 Nikkor lens at 300mm; 2,000 ISO; spot metering; Lightroom, using the Camera Neutral film simulation. 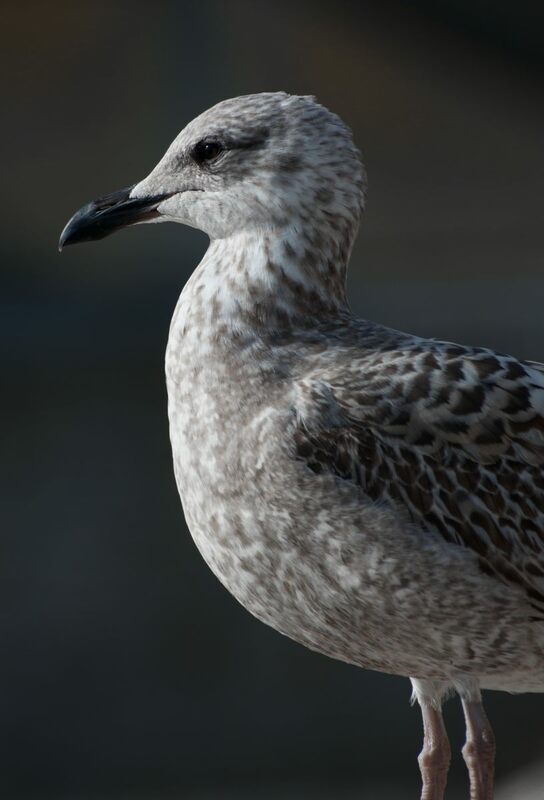 Herring Gull Larus argentatus at a city centre food source. An adult, in breeding plumage. 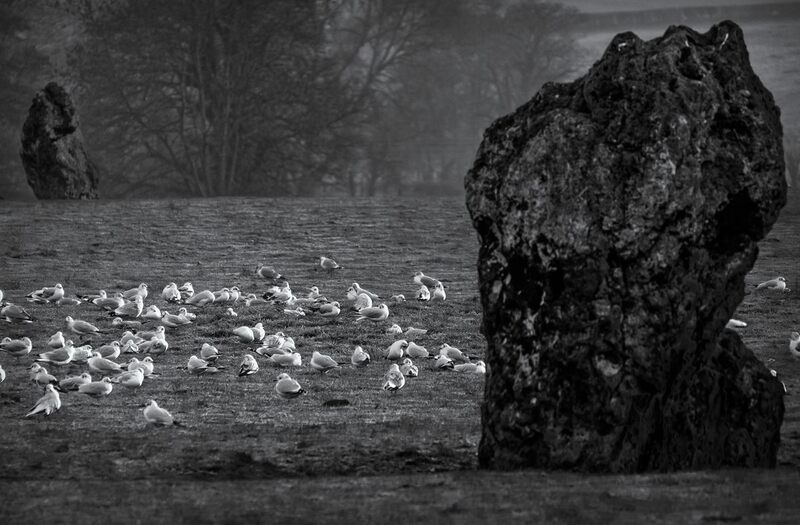 Gulls? Rats with wings is one name I’ve heard for them but, as always, I love them, having grown up alongside them all those years ago – this is a photo for you, Lynn, my ex-birder friend – enjoy! Technique: X-T2 with 55-200 Fujinon lens at 305mm (equiv); 6400 ISO; Lightroom, using the Velvia/Vivid film simulation; Welsh Back, central Bristol; 2 Feb 2018. Walking in south Bristol on a frosty morning, with the sun just about to come up. 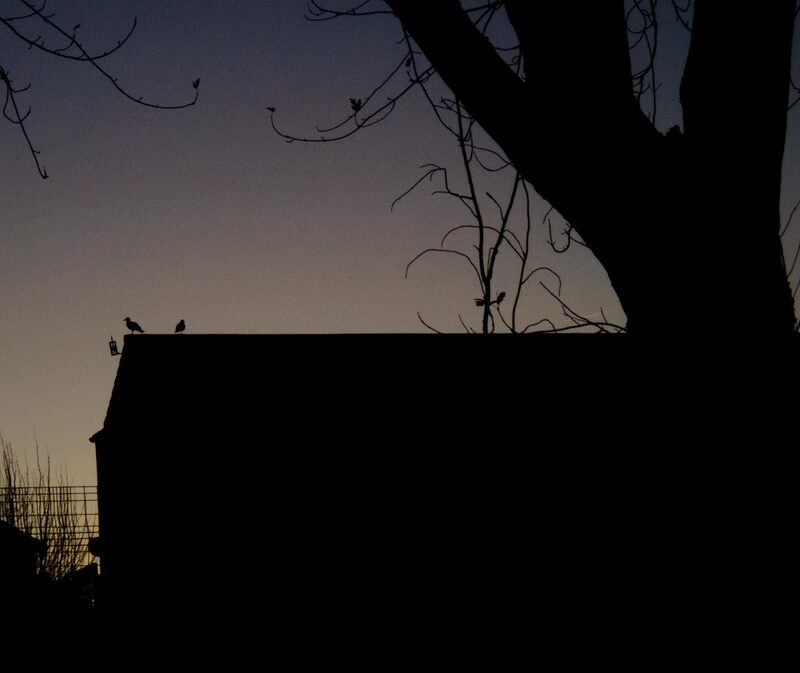 This silhouette opened up on my left: a building, a tall tree, curling branches – and two gulls, waiting for it to get a little lighter before starting to look for food. The sun is just about to appear: a tiny contrail just left of the tree’s massive trunk is already lit up. Technique: TG-5 at 100mm (equiv); 2,000 ISO; Lightroom, using the Camera Vivid film simulation; south Bristol; 28 Nov 2017. Emerging warm and well fed from Hart’s Bakery, I gazed up into the blues of a cold dawn. 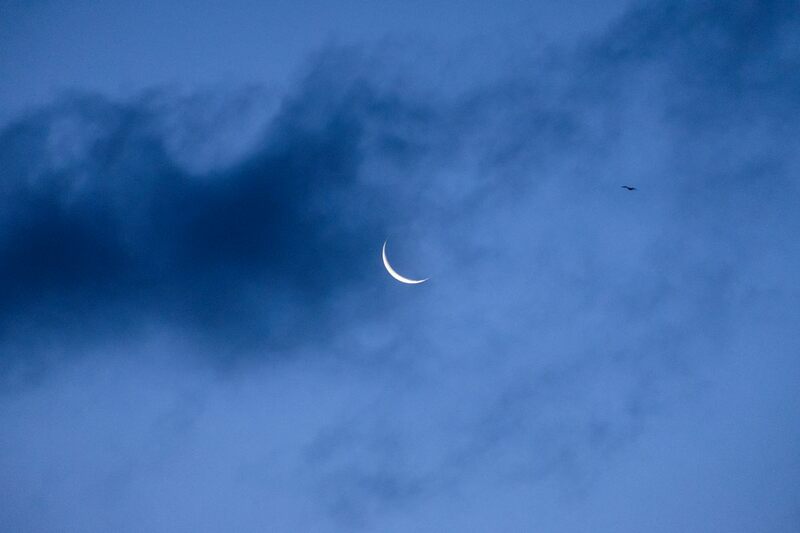 And there was the sliver of a crescent Moon, strikingly beautiful, amidst wisps of passing cloud. 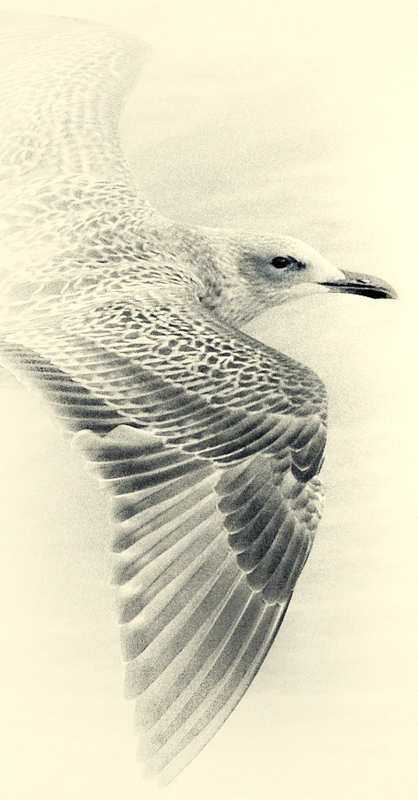 And all at once the crowing of gulls, and there they came, drifting over high from the west. 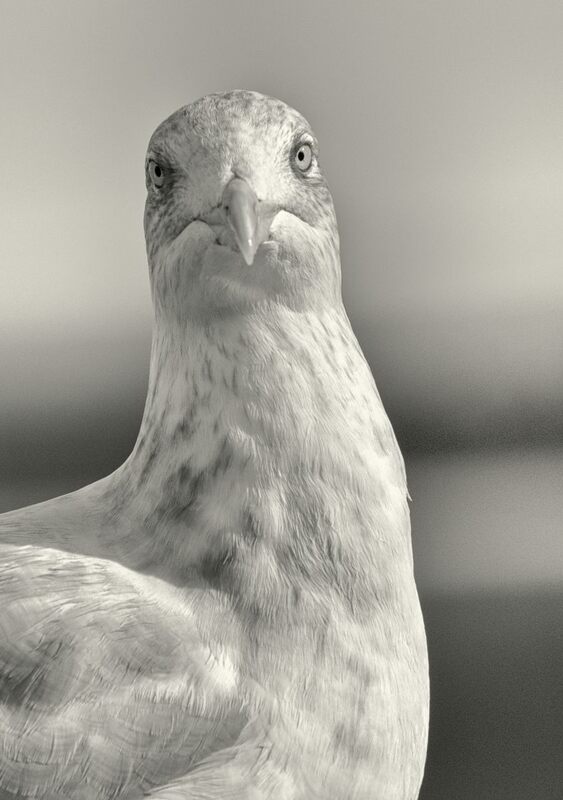 I knew those calls, they were the larger Herring and Lesser Black-backed Gulls, coming in ravenously over the city, looking for something – anything! – to eat. The city’s noise was already starting up around me but up there, where they were flying, there were only the sounds of the wind and the birds. I imagined what they could see. Below, the city’s lights, and then up above, the thin, drifting billows of vapour and that brilliant, shining crescent. Fly well, my friends, go well – 60 years ago, I grew up beside your ancestors on the coast; their calls were my constant companions. And now my city is your bread basket, and the cold waters of its reservoirs the safe havens upon which you spend the long hours of dangerous darkness. And there was humour in the moment too. A man appeared at my elbow, asking what I was photographing, telling me he’s a photographer too, showing me images on his mobile phone – but heavens, man, I’m trying to photograph the ******* heavens, man!!! Phrases started passing through my mind … from days long ago, giving as good as I got as a rugby forward … give him a dead leg … kick him in the …. but, this is Life, and I can only smile now at the recollection of the moment. The camera did well. I was leaning back, braced against a high wall, but in that light the lens was wide open and, at x6 magnification and at a shutter speed only 1/75th – this image is a tribute to the X-T2’s image stabilisation. The bird may not be perfectly sharp, but that’s not a factor here. I could have used a higher ISO, but in the heat of the moment just went with it. Click onto the image to open a larger version in a separate window, and click onto that image to enlarge it further – certainly recommended. Technique: X-T2 with 55-200 Fujinon lens at 305mm (equiv); 6400 ISO; Lightroom, using the Provia/Standard film simulation; beside Temple Meads Station, Bristol; 15 Dec 2107.